In recent years, new paradigms have emerged to replace-or augment-the traditional, mathematically based approaches to optimization. The most powerful of these are genetic algorithms (GA), inspired by natural selection, and genetic programming, an extension of GAs based on the optimization of symbolic codes. 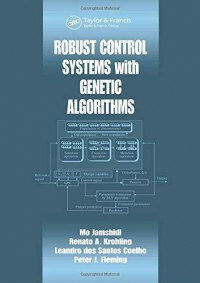 Robust Control Systems with Genetic Algorithms builds a bridge between genetic algorithms and the design of robust control systems. After laying a foundation in the basics of GAs and genetic programming, it demonstrates the power of these new tools for developing optimal robust controllers for linear control systems, optimal disturbance rejection controllers, and predictive and variable structure control. It also explores the application of hybrid approaches: how to enhance genetic algorithms and programming with fuzzy logic to design intelligent control systems. The authors consider a variety of applications, such as the optimal control of robotic manipulators, flexible links and jet engines, and illustrate a multi-objective, genetic algorithm approach to the design of robust controllers with a gasification plant case study. The authors are all masters in the field and clearly show the effectiveness of GA techniques. Their presentation is your first opportunity to fully explore this cutting-edge approach to robust optimal control system design and exploit its methods for your own applications. For students looking for a quick nuts and bolts overview to the Principles of Economics. Gives students quick pointers to the essentials. Softcover.